1. 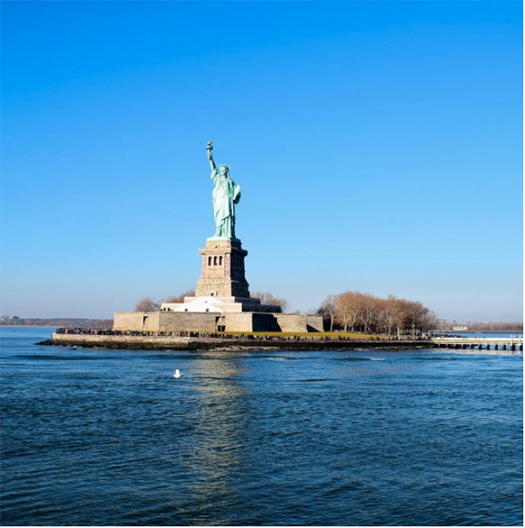 The Statue of Liberty represents Libertas – the Roman Goddess. Libertas was the Roman Goddess of freedom. The full title of the Statue is ‘Liberty enlightening the world’. 2. Her construction was a joint effort. Many reports say that the Statue of Liberty was a gift from France to the USA to commemorate the declaration of Independence. However, it was France’s idea but it was more of a joint effort than a gift - with fundraising and construction being carried out on both sides of the Atlantic. 3. The statue was the idea of Frenchman Edouard de Laboulaye. He was the first to propose the idea of a statue for the USA. Later, Frederic Auguste Bartholdi a French sculptor was commissioned to create the Statue of Liberty. The aim was to have it ready to commemorate the centennial of the American Declaration of Independence. The Statue of Liberty holds a torch and a tablet, upon which the date of the American Declaration of Independence is inscribed. 4. Fundraising for her construction was also a joint effort. America was to build the pedestal and the French were to build the statue. Fundraising efforts to cover the cost of the statue were made in both countries. However, raising funds proved to be challenging. Joseph Pulitzer came to the rescue encouraging the American public to donate. He also printed the names of every person who had donated anything – no matter how much – on his newspaper pages. This encouraged more donations, and at the same time increased the circulation of his paper. 5. The designer of the Eiffel Tower in Paris was also involved in her creation. Alexandre Gustave Eiffel (designer of the Eiffel Tower) designed the iron skeletal framework of the statue. This allows the Statue's copper skin to move independently. From the ground to the top of her torch, the Statue of Liberty measures 93 meters, weighs 204 tons and wears a size 879 shoe. 6. She made her journey from France to New York in 350 individual pieces. America designed and made the pedestal and France designed and built the statue. She was completed in France in July 1884 and almost a year later in June 1885, she sailed to New York aboard a frigate named Isere. To make the trip the statue was reduced to 350 pieces in over 200 crates. Once in New York, it took 4 months to put her back together again. The seven spikes on her crown represent the world’s seven continents and seven oceans. 7. She intended to commemorate the centennial of the American Declaration of Independence. However, the statue was installed on 28 October 1886 – almost ten years after the centennial celebration. 8. She was apparently originally intended for the Suez Canal. Bartholdi was amazed by the concept of the Suez Canal when he was a young man. He told the leader of Egypt that he wanted to create a sculpture that would be placed at the entrance to the canal. Khedive, the leader of Egypt, had been supportive but presumably did not like the concept when he saw the design. It’s thought he did not like that it would be a woman dressed in the robes of a slave. The idea didn’t go any further. 9. She was originally supposed to be a lighthouse. The Statue of Liberty stands on Liberty Island. It was previously called Bedloe Island. The author, Elizabeth Mitchell in her book Liberty’s Torch, has said that when the owner of Bedloe Island gave permission for Liberty to be placed there, he also pushed forth the argument that she must be a lighthouse. For a few years at least, she did work as a lighthouse and was operated by the Lighthouse Board as a navigational aid. 10. She almost found herself in Central Park. Bartholdi considered homing Liberty in Central Park or Prospect Park at one stage. Can you imagine how she would have dominated either of those locations?! 11. Not everyone identified with the Statue of Liberty. In 1886 when the statue was completed and unveiled, the suffragettes found it sad and ironic that a giant female statue was placed in New York to signify liberty, when women across the country did not have the liberty and freedom to vote. Also, the African American press also noted the bitter irony of the Statue of Liberty underlining that America was a just and free society for all, yet they still suffered intolerance. The Statue of Liberty did not represent enlightenment to everyone. The statue has an iron infrastructure and a copper exterior, which has turned green due to oxidisation. 12. 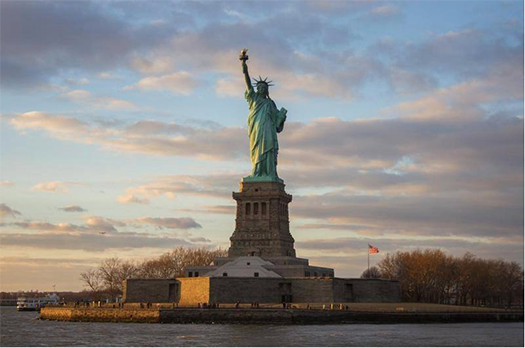 The Statue of Liberty has been a UNESCO World Heritage site since 1984. UNESCO’s statement of significance describes the statue as a ‘masterpiece of the human spirit and a highly potent symbol inspiring contemplation, debate and protest’. The best value way to see New York City and The Statue of Liberty. The team at Gray Line New York offers the best way to tour New York City with our Hop-On Hop Off bus tours. We stop at all the main sights across the city and you can use our buses throughout the length of your stay – which is genuinely a very cost effective way to tour NYC since you can buy a pass that lasts for up to 48 or even 72 Hours. Get in touch with us today to plan your time whilst in New York, we’d love to help you get around the city. Visit our website at:graylinenewyork.com for more information. Or, you can see what our previous guests thought about their time with us on our TripAdvisor,Facebook and Twitter pages.